Along with anchos, they're the most commonly used chiles in Mexico (and in my kitchen). What the anchos are to 'deep' and 'rich', guajillos [gwah-HEE-yoh] are to 'spicy' and 'dynamic'... a puree of toasted, rehydrated guajillo sings with a chorus of bright flavors that combine spiciness, tanginess (like cranberry), a slight smokiness and the warm flavor of a ripe, juicy, sweet tomato; the flavors go on and on. 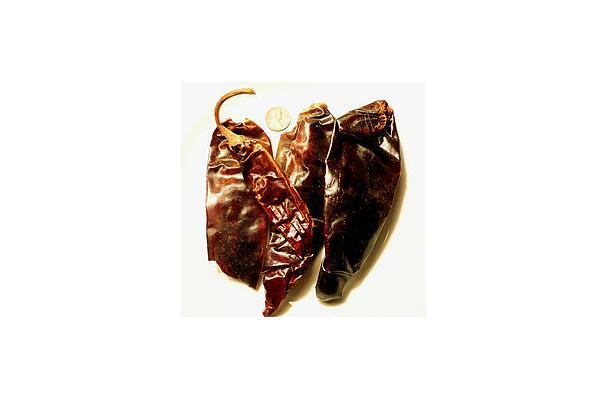 Guajillo chiles are moderately hot chiles with a smooth, shiny reddish-brown tough skin. They need to be soaked in water longer before using it for cooking. Buying: Guajillos are commonly sold as whole or dried. There are also some who sell it in powdered form or as a paste. Guajillos are usually lightly toasted on a pan before using and then soaked in water for a few minutes to soften the leathery skin. Cleaning: Wipe the chilies with a moist towel to remove any dust or visible soil. Remove the stem, seeds, veins, and rinse them under running water. After doing this, the chilies are ready for soaking. Store the chilies in an airtight container in a cool dry place.